Listeria monocytogenes is a facultative intracellular bacterium which can survive and replicate in professional phagocytes such as macrophages (Mφ) . Listeriolysin O (LLO) encoded by hly gene is one of the most important virulence factors of L. monocytogenes . LLO allows L. monocytogenes to escape from the phagosome into the cytosol in Mφ [3-5]. A vast majority of L. monocytogenes are trapped in the liver immediately after systemic infection  and liver parenchymal cells (LPC) serve as a habitat of this bacterium , suggesting that L. monocytogenes invades LPC using any entry factor(s). Although LLO has been shown to be involved in invasion of L. monocytogenes into human LPC [8, 9], it remains to be determined whether LLO participates in invasion of this bacterium into murine LPC. E-cadherin is an intercellular adhesion molecule highly expressed on basolateral membrane of intestinal epithelial cells (IEC) as well as LPC [10-13]. Because (i) L. monocytogenes expresses internalin A (InlA) encoded by inlA gene [10, 14], (ii) InlA is one of the ligands for human E-cadherin [10, 15], (iii) L. monocytogenes lacking inlA gene is unable to invade human IEC [16, 17] and (iv) L. monocytogenes passes through the intestinal barrier of transgenic mice expressing human E-cadherin in InlA-dependent manner although no invasion of L. monocytogenes is found in normal mice , interaction between InlA and E-cadherin plays a pivotal role in invasion of L. monocytogenes into human IEC [10, 14-17]. Similar to human, E-cadherin is expressed on murine LPC as well as IEC [12, 13]. However, because an amino acid sequence of murine E-cadherin considerably differs from that of human E-cadherin, murine E-cadherin is unable to bind to InlA . Yet, L. monocytogenes is isolated not only from the mesenteric lymph nodes, but also from the liver and the spleen after p.o. infection in normal mice [20-22]. It is therefore possible that unknown mechanism exists in invasion of L. monocytogenes into murine LPC and IEC. Indeed, ligand(s) other than InlA which can interact with E-cadherin has been identified in both human and mice [23-25]. Therefore, we raise the question of whether ligand(s) for murine E-cadherin other than InlA participate in invasion of L. monocytogenes. In the present study, we reevaluated whether murine E-cadherin is not indeed involved in invasion of L. monocytogenes into murine LPC using LPC expressing and lacking murine E-cadherin, and examined whether LLO is involved in invasion of this bacterium into murine LPC. We first compared the surface expression of murine E-cadherin on AII (kindly provided by Dr. Peter Lösser (Robert Koch Institute)) derived from p53 knockout mice  and HepSV40 (kindly provided by Dr. Peter Lösser (Robert Koch Institute)) derived from Simian virus (SV) 40 large T antigen transgenic mice  by flow cytometry. AII and HepSV40 were stained with carboxyfluorescein-conjugated anti-mouse E-cadherin mAb (Clone: 114420; R&D Systems, Minneapolis, MN). After washing with PBS containing 0.1 % bovine serum albumin (Wako Pure Chemical Industries, Osaka, Japan) and 0.1 % sodium azide (Wako Pure Chemical Industries), cells were acquired by FACSCalibur® (BD Biosciences, Mountain View, CA) and murine E-cadherin surface expression was analyzed with Flow Jo software (version 7.6.5; Tomy Digital Biology, Tokyo, Japan). As we expected, the majority of AII expressed murine E-cadherin (Fig. (1)). Surprisingly, murine E-cadherin-expressing cells were only marginal in HepSV40. Cell surface expression of murine E-cadherin on AII and HepSV40. 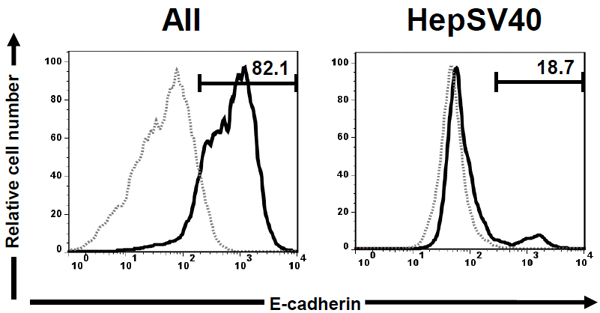 AII and HepSV40 were stained with carboxyfluorescein- conjugated anti-mouse E-cadherin mAb and the E-cadherin surface expression was analyzed by flow cytometry. The profiles of E-cadherin are displayed as histograms. Dotted and solid lines represent LPC lines unstained and stained with anti-mouse E-cadherin mAb. Numbers in histograms represent percentages of E-cadherin+ cells. Representative staining patterns from 2 independent experiments are shown. CFU in AII and HepSV40 after L. monocytogenes infection. AII and HepSV40 were incubated with L. monocytogenes infection (strains EGD or Δhly) in RPMI 1640 suplemented with 10 % fetal calf serum (complete medium; CM) for 1 h. After removing their culture supernatants, the LPC lines were washed 3 times with CM containing 10 µg/ml of gentamicin to kill extracellular L. monocytogenes infection. Immediately after washing with CM, a portion of cells were plated on tryptic soy agar plate after sonication, and the CFU in LPC were enumerated by plate counts after 48 h incubation. Representative data from 3 independent experiments are shown. The statistical significance was determined by Student t-test and p value of < 0.05 was regarded as significant. *, p < 0.05 : EGD vsΔhly. To examine whether murine E-cadherin is not indeed involved in invasion of L. monocytogenes into murine LPC, AII (5 × 104 cells) expressing murine E-cadherin and HepSV40 (2 × 105 cells) lacking murine E-cadherin were incubated with 5 × 105 colony-forming units (CFU) and 2 × 106 CFU of L. monocytogenes (strains EGD and Δhly), respectively for 1 h and the CFU in these cells were determined as described previously . Considerable numbers of L. monocytogenes were detected in both AII and HepSV40, and the numbers were comparable (Fig. (2)). The number of strain EGD in HepSV40 was significantly higher than that of strain Δhly. Similarly, the number of strain EGD in AII was considerably, though not significantly, higher than that of strain Δhly (Fig. (2)). We show here the involvement of murine E-cadherin and LLO in invasion of L. monocytogenes into murine LPC. The number of strain EGD in HepSV40 was slightly, though not significantly, higher than that in AII, despite the fact that the number of E-cadherin+ cells was markedly higher in AII as compared to HepSV40. These RESULTS strongly indicate that murine E-cadherin is not involved in invasion of L. monocytogenes into murine LPC. Because (i) internalin B (InlB) is one of the ligands for hepatocyte growth factor receptor (HGF-R / Met) [14, 16], (ii) Met and InlB are highly expressed on murine LPC and L. monocytogenes, respectively [14, 29] and (iii) the interaction between InlB and Met has been shown to play a central role in invasion of L. monocytogenes into human and murine IEC [30-34], we consider it likely that L. monocytogenes invades murine LPC through interaction between Met and InlB. Numbers of strain Δhly in AII and HepSV40 were markedly lower than those of strain EGD. Because strain Δhly is unable to secrete LLO  and because LLO has been shown to participate in invasion of L. monocytogenes into human LPC [8, 9], we assume that LLO is involved in invasion of L. monocytogenes into murine LPC. Although E-cadherin is normally expressed on the surface of LPC [11, 12], HepSV40 lacked surface expression of E-cadherin. Consistent with this, Rip1Tag2 mice which are SV40 large T-antigen transgenic mice also lack surface expression of E-cadherin . 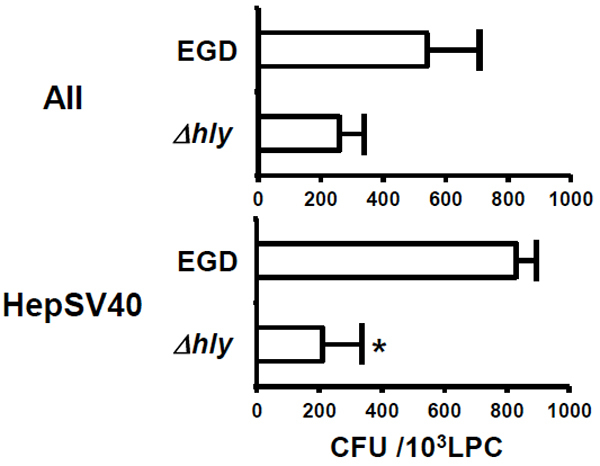 We therefore consider it likely that SV40 down-regulates E-cadherin surface expression on LPC. In conclusion, we verified that murine E-cadherin was not involved in invasion of L. monocytogenes into murine LPC and obtained the first evidence that LLO participates, at least in part, in invasion of L. monocytogenes into murine LPC. Although we were unable to determine the molecule(s) which participate in invasion of L. monocytogenes into murine LPC, we consider it likely that interaction between InlB and Met is involved in this mechanism. As shown here, characteristic features (e.g. E-cadherin surface expression) of cells are dramatically changed by insertion of transgene. It is therefore possible that the insertion of transgene influences on the data, by which the conclusion could be changed. Therefore, the data obtained from experiment using transgenic mice should be reevaluated and the conclusion should be drawn with care. This work was supported by a Grant-in-Aid for Scientific Research (22300261 to M.E. and 22590388 to Y.E.) from the Japan Society for the Promotion of Science. Cossart P. Illuminating the landscape of host-pathogen interactions with the bacterium Listeria monocytogenes. Proc Natl Acad Sci USA 2011; 108(49): 19484-91. Cossart P, Vicente MF, Mengaud J, Baquero F, Perez-Diaz JC, Berche P. Listeriolysin O is essential for virulence of Listeria monocytogenes: direct evidence obtained by gene complementation Infect Immun 1989; 57(11): 3629-36. Goldfine H, Wadsworth SJ. Macrophage intracellular signaling induced by Listeria monocytogenes. Microbes Infect 2002; 4(13): 1335-43. Lety MA, Frehel C, Beretti JL, Berche P, Charbit A. Modification of the signal sequence cleavage site of listeriolysin O does not affect protein secretion but impairs the virulence of Listeria monocytogenes Microbiology 2003; 149(Pt 5): 1249-55. Portnoy DA, Jones S. The cell biology of Listeria monocytogenes infection (escape from a vacuole) Ann N Y Acad Sci 1994; 730: 15-25. MacKaness GB. Cellular resistance to infection J Exp Med 1962; 116: 381-406. Rosen H, Gordon S, North RJ. Exacerbation of murine listeriosis by a monoclonal antibody specific for the type 3 complement receptor of myelomonocytic cells. Absence of monocytes at infective foci allows Listeria to multiply in nonphagocytic cells J Exp Med 1989; 170(1): 27-37. Vadia S, Arnett E, Haghighat AC, et al. The pore-forming toxin listeriolysin O mediates a novel entry pathway of L. monocytogenes into human hepatocytes PLoS Pathog [serial on the Internet]. 2011 Nov 3; [cited 2015 May 27]; 7: [about 20 screens]. Available from: http://journals.plos.org/plospathogens/article?id=10.1371/journal.ppat.1002356 2011. Vadia S, Seveau S. Fluxes of Ca2+ and K+ are required for the listeriolysin O-dependent internalization pathway of Listeria monocytogenes. Infect Immun 2014; 82(3): 1084-91. Mengaud J, Ohayon H, Gounon P, Mege R-M , Cossart P. E-cadherin is the receptor for internalin, a surface protein required for entry of L. monocytogenes into epithelial cells Cell 1996; 84(6): 923-32. Shimoyama Y, Hirohashi S, Hirano S, et al. Cadherin cell-adhesion molecules in human epithelial tissues and carcinomas Cancer Res 1989; 49(8): 2128-33. Butz S, Larue L. Expression of catenins during mouse embryonic development and in adult tissues Cell Adhes Commun 1995; 3(4): 337-52. Hermiston ML, Gordon JI. In vivo analysis of cadherin function in the mouse intestinal epithelium: essential roles in adhesion, maintenance of differentiation, and regulation of programmed cell death J Cell Biol 1995; 129(2): 489-506. Lingnau A, Domann E, Hudel M, et al. Expression of the Listeria monocytogenes EGD inlA and inlB genes, whose products mediate bacterial entry into tissue culture cell lines, by PrfA-dependent and -independent mechanisms Infect Immun 1995; 63(10): 3896-903. Bonazzi M, Lecuit M, Cossart P. Listeria monocytogenes internalin and E-cadherin: from bench to bedside Cold Spring Harb Perspect Biol [serial on the Internet]. 1:[about 20 screens]. Available from: http://cshperspectives.cshlp.org/content/1/4/a003087.long 2009. [cited 2015 May 27]. Dramsi S, Biswas I, Maguin E, Braun L, Mastroeni P, Cossart P. Entry of Listeria monocytogenes into hepatocytes requires expression of inIB, a surface protein of the internalin multigene family Mol Microbiol 1995; 16(2): 251-61. Pizarro-Cerdá J, Kühbacher A, Cossart P. Entry of Listeria monocytogenes in mammalian epithelial cells: an updated view Cold Spring Harb Perspect Med [serial on the Internet]. 2012 Nov 1; [cited 2015 May 27]; 10: [about 20 screens]. Available from: http://perspectivesinmedicine.cshlp.org/content/2/11/a010009.long 2012. Disson O, Grayo S, Huillet E, et al. Conjugated action of two species-specific invasion proteins for fetoplacental listeriosis Nature 2008; 455(7216): 1114-8. Lecuit M, Dramsi S, Gottardi C, Fedor-Chaiken M, Gumbiner B, Cossart P. A single amino acid in E-cadherin responsible for host specificity towards the human pathogen Listeria monocytogenes. EMBO J 1999; 18(14): 3956-63. Audurier A, Pardon P, Marly J, Lantier F. Experimental infection of mice with Listeria monocytogenes and L. innocua. Ann Microbiol (Paris) 1980; 131B(1): 47-57. Marco AJ, Altimira J, Prats N, et al. Penetration of Listeria monocytogenes in mice infected by the oral route Microb Pathog 1997; 23(5): 255-63. Bou Ghanem EN, Myers-Morales T, Jones GS, et al. Oral transmission of Listeria monocytogenes in mice via ingestion of contaminated food J Vis Exp 2013; [serial on the Internet]. 2013 Jun 5; [cited 2015 May 28]; 75: [about 15 screens]. Available from: http://www.ncbi.nlm.nih.gov/pmc/articles/PMC3676286/ 2013.
 von Schlippe M, Marshall JF, Perry P, Stone M, Zhu AJ, Hart IR. Functional interaction between E-cadherin and alphav-containing integrins in carcinoma cells J Cell Sci 2000; 113(Pt 3): 425-37. Lilien J, Balsamo J. The regulation of cadherin-mediated adhesion by tyrosine phosphorylation/dephosphorylation of β-catenin Curr Opin Cell Biol 2005; 17(5): 459-65. Rosshart S, Hofmann M, Schweier O, et al. Interaction of KLRG1 with E-cadherin: new functional and structural insights Eur J Immunol 2008; 38(12): 3354-64. Donehower LA, Harvey M, Slagle BL, et al. Mice deficient for p53 are developmentally normal but susceptible to spontaneous tumours Nature 1992; 356(6366): 215-21. Paul D, Höhne M, Pinkert C, Piasecki A, Ummelmann E, Brinster RL. Immortalized differentiated hepatocyte lines derived from transgenic mice harboring SV40 T-antigen genes Exp Cell Res 1988; 175(2): 354-62. Kaneko M, Emoto Y, Emoto M. Acquired resistance of Listeria monocytogenes in and escaped from liver parenchymal cells to gentamicin is caused by being coated with their plasma membrane Microbes Infect 2014; 16(3): 237-43. Yang XM, Park M. Expression of the hepatocyte growth factor/scatter factor receptor tyrosine kinase is localized to epithelia in the adult mouse Lab Invest 1995; 73(4): 483-91. Shen Y, Naujokas M, Park M, Ireton K. InIB-dependent internalization of Listeria is mediated by the Met receptor tyrosine kinase Cell 2000; 103(3): 501-10. Mostowy S, Janel S, Forestier C, et al. A role for septins in the interaction between the Listeria monocytogenes INVASION PROTEIN InlB and the Met receptor Biophys J 2011; 100(8): 1949-59. Bierne H, Cossart P. InlB, a surface protein of Listeria monocytogenes that behaves as an invasin and a growth factor J Cell Sci 2002; 115(Pt 17): 3357-67. Kim H, Marquis H, Boor KJ. SigmaB contributes to Listeria monocytogenes invasion by controlling expression of inlA and inlB Microbiology 2005; 151(Pt 10): 3215-22. Khelef N, Lecuit M, Bierne H, Cossart P. Species specificity of the Listeria monocytogenes InlB protein Cell Microbiol 2006; 8(3): 457-70. Hara H, Kawamura I, Nomura T, Tominaga T, Tsuchiya K, Mitsuyama M. Cytolysin-dependent escape of the bacterium from the phagosome is required but not sufficient for induction of the Th1 immune response against Listeria monocytogenes infection: distinct role of Listeriolysin O determined by cytolysin gene replacement Infect Immun 2007; 75(8): 3791-801. Perl AK, Wilgenbus P, Dahl U, Semb H, Christofori G. A causal role for E-cadherin in the transition from adenoma to carcinoma Nature 1998; 392(6672): 190-3.